There are 24 reviews of Ferré for Men. I've not been writing reviews on the exploration of the masculine side of fragrances. I don't have enough experience to offer anything meaningful, and most of these feel utterly alien compared to anything I'd wear myself. I really have to mind warp myself in evaluating them from either a man's perspective, or keeping in mind what I'd like to smell on a man. That ends with Ferre. As soon as it hit my wrist, I thought, hey, deodorant. I can promise you, neither I nor any man in my life *ever* wore a scented deodorant. My ability to actually analyze a fragrance remains abysmal with Ferre--oh, I can get a top note, and I can get a basenote or two. Heartnotes seem to escape me utterly. What doesn't escape me with Ferre, and what's never happened to me before (never is a big word and I mean it,) it the way Ferre makes me flinch when I sniff it up close--not from a particular displeasure, but from a tiny needle that hits my sensitive upper nose. I can fatigue this need to sneeze, and concentrate on the fragrance for a deeper sniff, and it makes me cough. I'm wondering if this the "scratchy" synthetic sandalwood I've read of, or a particularly piercing lavender over a particularly soapy vetiver, not ignoring synthetic oakmoss which is never a note I enjoy. It's an easy decision to leave the close sniffing out as the fragrance progresses, and I go forward in a realistic manner of catching whiffs through the day. Whiffs that always say "Hey. More than deodorant--this is deodorant on armpit." Floral vetiver AND musk. Fresh AND...well, not dirty per se, but sour and piercing, with a bit of a lye/caustic feel. LOL! I started this review with a neutral thumb--reading back my own impressions, how can I let that stand? Thumbs down from this woman. Ferré for Men (nothing to do with Ferré for Man from 1986) is for me one of the most representative epitomes of “half-baked” fragrances. It’s perfectly split in half, on a time axis: one is really – really! - good, the other is not tragic, but a bit disappointing. The opening is perfect for me, a surprisingly rich buttery iris with a remarkably elegant “lipstick” effect on a musky-mossy base and refreshed with some zesty notes of bergamot, and probably that “pineapple” too, since there’s indeed some really subtle fruity feel that gives some sweet brightness to iris. Less quality than Dior Homme, a bit darker and woodier and with a sort of poliurethane-leather feel, but surely Dior Homme may be a broad comparison. Either that, or even more L’Homme de Coeur by Divine. This is the best part of the evolution, a really elegant opening phase perfectly balanced between “masculine” musky-woody-leathery notes, a hint of mainstream spiciness (tonka above all), a feminine touch of lipstick iris, and a whiff of aromatic freshness. Sadly though, the progression isn’t really consistent: the iris note tones down quicker than I expected and so does its really nice sort of citrus-fruity support, and Ferré for Men slowly turns into a generic woody-musky scent with a generic spicy accord (tonka again, now more prominent) and a generic touch of synthetic leather, just tinged with a really mild and light touch of iris (mostly soapy musk than the initial “lipstick” iris). Like a good supporting band without its leader. Still better than most of mainstream average of this same “contemporary Oriental” family, nothing bad and totally nice to wear, but surely way less refined and intriguing than the first phase. I still consider this a good scent overall, and I’d even suggest you to grab a bottle if you stumble upon nice deals; just a bit disappointing after a while – so either settle for this, or keep reapplying it. A fragrance of Intense Sensations with a Beautiful rebellious Hint! A Lovely Scent that grab attention so many Ladies as is Irresistible for them. Romantic,Warm,Sweet,Interesting, Unisex,Seductive but not Special. A blend of Bergamot,Pineapple and Lavender for a Fresh and Great opening. A Romantic Heart Sheer from Flowers that Makes you Elegant Feel However is Little Feminine.A Woody and Soft base with patchouli, Amber,Musk and Vetiver. Vanilla makes it Sweet but not overly sweet and not Cloying. 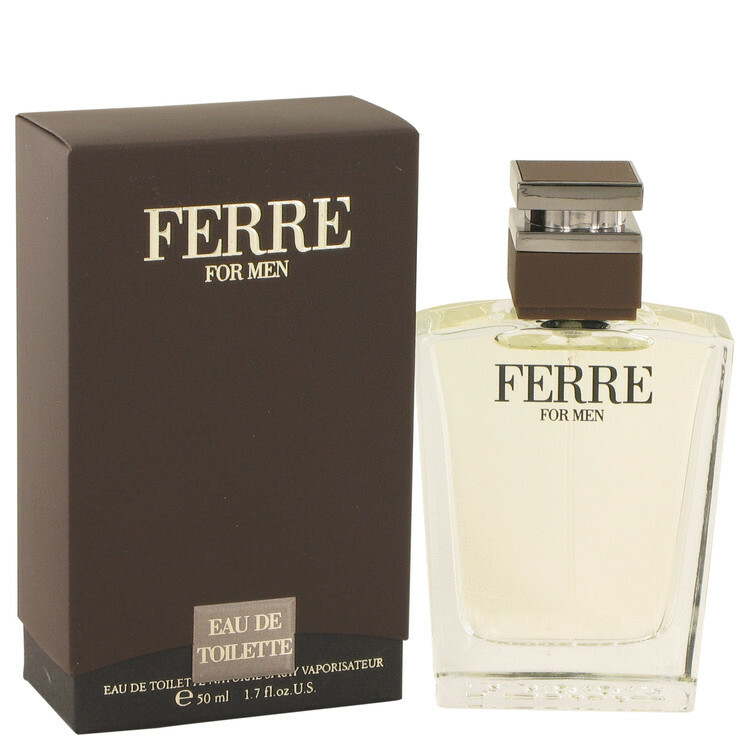 FERRE For Men is both Youthful and Mature Simultaneously.More Appropriate for Night time wear.when you wear it people will think you are a Romantic. Suitable for a Romantic Dinner or Wedding in AUTUMN. The comparison with its great predecessor of the same brand (i'm refering to the greater and far more genuine and complex Gianfranco Ferre For Man) is hard to be carried out since this one expresses that plastic vibe (some reviewers talk fairly about lipstick effect) which represent the symbol of the dangerous new modern olfactory decline of the dasigner fragrances. The smell is not so bad itself but is not genuine and complex, it exudes a sort of buttery fruity-floral character too banal and common to be seriously appreciated nowadays. The smell, despite the numerous listed notes, is quite linear since, after a citrusy and vague fruity-floral stage it fades towards a mossy and ambery dry down a bit nutty, slightly powdery and buttery. Nothing special. The orangy-grapefruit undertone is evident. I smell the association with Dior Homme (especially in the cool-warm link of bergamot, lavender, iris, patchouli and mossy amber) but this is more fruity-floral and gummy, lacking of the notorious cacao undertone proper of DH. Iris, patchouli and tonka contribute to barely shadow the juice itself and the note of jasmine is fairly joined to the general smoothness. A modern involution and nothing else. This is a bold yet universal scent for men that expresses personality in a subtle way suitable for most anywhere any time of day. It is woody, citrusy, and has longevity of at least 8-10 hours. This fragrance transcends age, profession, seasons, etc. It is a delightful standard for anyone who wants to express themselves appropriately in any situation throughout the day. If you are new to Men's cologne and uncertain, this is the one to try. It suits most any personality in most any circumstance and is very forgiving to over application. I can't imagine that it would offend anyone even if they might not love it themselves. None of the negative adjectives here (i.e. "lipstick" "waxy" "floral or iris", etc.) suits my experience at all. Lipstick! It's all I get form this composition. It opens with a sweet fruity / floral accord that stays linear for quite a while then, suddendly, a waxy note come in turning this fragrance into "lipstick". Sweet and mossy drydown. Sweet and languid. Not my type. There are no member images of Ferré for Men yet. Why not be the first?